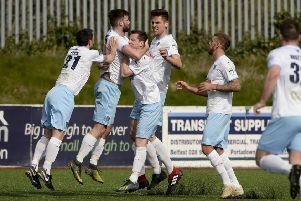 Ballymena United skipper Jim Ervin believes the Sky Blues will get back on an upward curve sooner rather than later. David Jeffrey’s United side went ten games unbeaten and saw off the challenges of Glentoran, Cliftonville, Linfield and Crusaders in that fantastic spell. But defeats against Glenavon and Ards have left United fans feeling a bit flat in recent days but Ervin says they are ready to bounce back against Ballinamallard at the Showgrounds on Saturday. “It will be a tough and physical game against Ballinamallard as they are a good footballing side but we want to get another win under our belts. “We all knew the unbeaten run would not last but the last two performances have been disappointing. “Against Glenavon is was just one of those days. On another day we could have come in at 3-2 or 3-3 against Glenavon at half-time but we came in 3-0 down. “And in the second half we created more chances but fair play to Glenavon they deserved the win. “Against Ards we were just poor. There was plenty of effort and commitment but there is not one player who can say he played well that night. “We were just poor and we have to respond against Ballinamallard,” he added. And Ervin says manager Jeffrey is moving the club in the right direction.